A Family Fun Stop thats educational and entertaining! 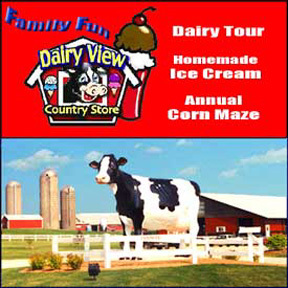 Learn about the Wisconsin dairy industry and experience it first hand by watching the ongoing milk operations, milk cookie the cow and then taste the end result - 30 flavors of homemade ice cream. Tour our grounds & enjoy our homemade fudge, homemade soup & pizza, and Panini bread grilled cheese and ham or turkey, plus hot dogs and dessert treats like cookies & cheesecake. Open Daily June-October 10:00a.m. - 8:00 p.m.